It was a particularly long ride home from work. Sunshine and I car pool and have been all year. We drive, more accurately I drive, from the Casa to a metro station close to her office. Then I ride a shuttle bus for another 20 minutes or so to the office. She then whips the car around for the last half mile or so to her office. Nice. The commute home is in reverse. Well this past week we both had to stop and use the restroom. 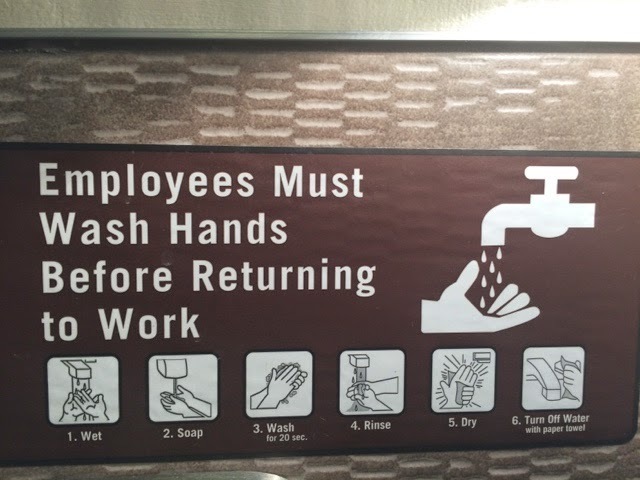 I found this sign in the bathroom. Funny thing, there are no paper towels in the bathroom. Now, for full disclosure the water did shut off automatically before I was done washing my hands. Still, there are no paper towels in the bathroom. Like I said, signs say it all.